What can we do to change the world? Plenty! With the Lord's help. Sister Celeste Mergens shares her testimony of the power of leaning on the Lord and the miracle and strength of His errands great and small. 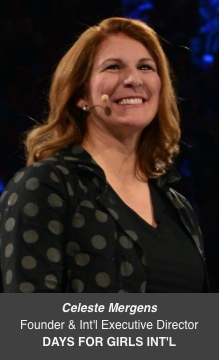 Celeste Mergens is the International Executive Director of Days for Girls, a worldwide organization whose mission is to empower girls, women and communities, and to create a more dignified, free and educated world through access to sustainable feminine hygiene solutions. The award-winning nonprofit organization which she founded in 2008, was named by Huffington Post in 2015 as “an organization whose mission will shape the next decade”. The mother of 6 children, grandmother of 13, Celeste is known for her always present smile. She was named 2014's American Mother of the Year for Washington State, and has has decades of experience in nonprofit organizational leadership, international relations and community development. Celeste is a moving speaker and her passion for sustainable global empowerment and girls and women is contagious, though if you ask her she would say that she is the "really good listener" who is privileged to do this work while serving alongside amazing supporters of Days for Girls. Celeste will join us having just traveled from her work in Bangladesh and on her way to speak at the United Nations Commission on the Status of Women. Celeste is coming to humbly share the miracles of Days for Girls, and how it is proof that our hands really can be the Lord’s hands, in lifting the weary and changing the world! In addition to speaking in our general session, Celeste will be providing education and training at the conference for interested women who would like to further the work of DfGI in their areas. Our service project this year will support the DfGI mission. 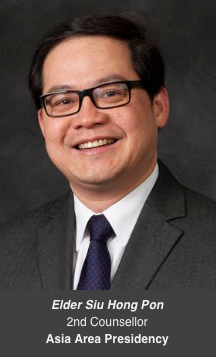 Elder Siu Hong Pon was named a member of the Eighth Quorum of the Seventy of The Church of Jesus Christ of Latter-day Saints on March 31, 2012. He is currently serving as a member of the Asia Area Presidency. Siu Hong Pon was born in Hong Kong, China on July 2, 1958. He married Cindy Wai King Chiu in October 1982 and they are the parents of four children. Elder Pon received a master’s degree in Business Administration from the University of East Asia in 1993. He began his career working for the Church in February 1980 and has served in several management positions in the Asia Area Finance Department. Prior to his retirement on March 1, 2015, he served in the Asia Area Controller position for 15 years. He has also worked in the Corporation of the Presiding Bishopric and as former director of the Hong Kong Public Affairs Council. Elder Pon has served in numerous Church callings, including bishop, branch president, mission president’s counselor, and stake president. We are delighted to welcome the newest member of the Asia Area Presidency to our conference, and are grateful for the chance to get to know him at the A.S.I.A Women's Conference this year. ​Amie Heap has been involved in humanitarian projects spanning the globe as the Senior Nutrition Advisor for the Bureau of Global Health for USAID (US Agency for International Development). Most recently focusing on integrating nutrition assessment, counselling and support within HIV/AIDS programs in over 14 African countries. This experience has been a profound education for her mind and heart. It has strengthened her understanding of the importance of the family - and the central role of women in shaping the world in which we live. ​Amie has seen firsthand how the power of serving others can change the lives of both the giver and the receiver, and the miracles that occur as people reach out to lift and strengthen those around them. 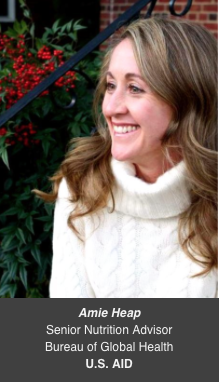 ​Amie currently lives in Washington, D.C., but previously, lived in Salt Lake City where she received her undergraduate degree in Clinical Nutrition from Brigham Young University and worked as the Clinical Nutrition Manager at Primary Children’s Medical Center. Amie enjoys every aspect of life on the East Coast, but loves to return home to her family and the mountains of Utah every chance she gets! Amie loves to run, bake, cook, read, and spend time with the youth. She currently serves as the Gospel Doctrine teacher in her ward. Amie is thrilled at the opportunity to join the A.S.I.A. Women’s Conference. Elder Chi Hong (Sam) Wong was serving as an Area Seventy in the Asia Area when he was sustained to the First Quorum of the Seventy on April 5, 2014. He is now serving as the 1st Counsellor in the Asia Area Presidency in Hong Kong. 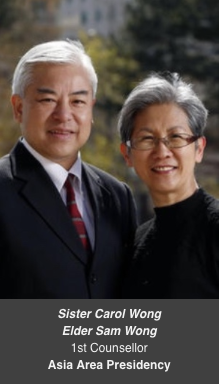 ​Since joining the Church in 1982, Elder Wong has served in numerous other Church callings, including ward financial clerk, ward clerk, Sunday School president, Young Men president, bishop’s counselor, bishop, stake president’s counselor, and stake president. Elder Wong was born in Hong Kong SAR, China. He received both a bachelor of science degree in accounting and an associate of science degree in computer science from Brigham Young University–Hawaii. He also received an MBA from the Hong Kong Open University. In his professional life he was the founder and partner of a business and quality consulting company and also worked at a materials testing and inspection group. Sister Carol Lu Wong was born and raised in Hong Kong where her father was baptized as one of the first members of the church. This meant that as an infant she received her baby blessing, which is something quite unique for a Chinese member her age. Though she didn't join the church until she was in her teens, Sis. Wong attended quite often in her primary years and still recalls those early days in the church in Hong Kong. Sister Wong’s pioneering heritage has blessed generations as their granddaughter is now the fifth generation of church members in her family. Sister Wong attended Brigham Young University Hawaii majoring in Social Work. After graduation, she met Elder Chi Hong (Sam) Wong and they were married in 1983. In the same year, they went to BYU Hawaii for his schooling and were sealed in the Laie Hawaii Temple. They are the parents of four children; a 16 year old daughter who is still at home (and who keeps them up to date with ever changing new technology), two sons studying at BYU, and one married son who lives in Los Angeles, who is the proud father of their first granddaughter. In her precious free time, Sister Wong likes to read; the scriptures, of course, but also novels and other good books. She also enjoys cooking; both watching and doing the actual cooking. Currently she is interested in western decorating, cooking, and table and food presentation. Sister Wong has served in many different church callings including ward and stake Relief Society Presidencies, ward Primary Presidency, ward Young Women President, Seminary teacher, and Sunday School teacher.